Kristian Larsson is working on TeraStream, Deutsche Telekom's next generation fixed network design project. In his role as IP Automation Lead Engineer, he is responsible for the design of the software system that runs TeraStream, encompassing all facets of building and operating a large-scale network. 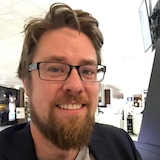 Previous to his role in TeraStream, Kristian was an IP & Opto Network Architect in the central team at Tele2, with a responsibility for the international backbone network AS1257 as well as for design coordination across the national networks in the Tele2 group. While his background is in building large networks, automation has always been a key piece in that work. He has written support systems for inventory and configuration management, like NIPAP which also happens to be open source. He also wrote vrnetlab to facilitate running virtual routers using containers for development and CI testing use. He is occasionally active within the IETF, writing on YANG models or working on NETCONF.